One of my favorite fall activities is to get lost in a corn field maze – I’ve been doing the one at Davis Mega Maze for over a decade. This year’s theme was a murder mystery. Steve and I managed to complete the maze in 2.5 hours and we were hungry for a large hunk of meat. 111 Chop House is part of the same restaurant group as Sole Proprietor, Steve’s favorite restaurant in Worcester, so we decided to head there. Luckily, there was no wait at 5pm on a Saturday. They are running a prime rib special this month - $24, including salad and potato. I opted for the wedge salad and mashed potato to go with my slab of meat. Sadly, they only offer medium and above on the doneness, so my meat was more done than I like, but the flavor was still good and I enjoyed the sides. Steve’s ribeye ($36) was excellent. It is unfortunate for Zelda that both steaks were boneless. 111 is surprisingly affordable; all entrees come with a salad, and when Steve ordered a side of roasted potatoes, the waitress offered him a ½ portion ($3) since I was getting the mashed potatoes already. My lemon drop martini was a stunning $6. I guess that’s how you know you aren’t in Boston anymore. The service was attentive and the bread basket was a warm baguette. The restaurant impressed me enough that I would like to try Via, the third restaurant in the group. We skipped dessert at 111 and Steve took me for a tour around his alma mater, Holy Cross. After a long walk around the picturesque campus, I was ready for dessert. We went to Sweet, a bakery and bar. It’s a weird space, you walk in and it looks like any bakery with a pastry case of cupcakes and such, but the back room has a full bar and a menu of sweet and savory offerings. The desserts all listed a recommend beer or wine to pair with. 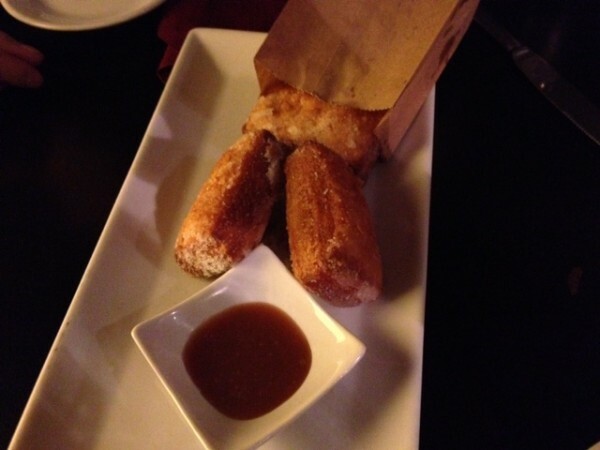 We got the "French" donuts: it was croissant dough filled with chocolate and fried. It was served with a caramel sauce for dipping. I thought it was unique and delicious. Steve felt like it was too sweet. The night we were there, there were cameras filming for something. I realized that I recognized the chef, Alina Eisenhauer, from her appearances on Food Network (Chopped and Sweet Genius). They gave us an amuse bouche of apple gelee in a shot glass topped with cinnamon whipped cream and with our check we got mini brownie petit fours. I have no idea if this is normal, or it was because of the filming, as it seems excessive to give both for people who shared one dessert. Error running style: S2TIMEOUT: Timeout: 4, URL: gltsoi.livejournal.com/145364.html at /home/lj/src/s2/S2.pm line 531.